Former ELCA Presiding Bishop Herbert Chilstrom. If ever a word has been hijacked and politicized and changed from its original meaning it is the term “evangelical.” Ask most anyone on the street to define “evangelical” and they will tell you that it represents someone who is opposed to gun control, abortion and birth control; someone who favors tight immigration restrictions and prayer in the public schools. You get the picture. The press relentlessly speaks of the “Evangelical Bloc” when it writes and broadcasts items about some members of the Republican Party and other conservative movements. This is sad for us in the Christian church who have a totally different understanding of what it means to be “evangelical.” We remember that the root meaning of the word goes back to the New Testament and the Greek language in which it was written. Its meaning is almost disarming in its simplicity. It describes one who believes the Good News about Jesus Christ. It centers in his death and resurrection that we will soon observe as the high points of our Christian year. We believe that at its heart the Bible is primarily about this unbelievable, incredible message of hope. When the Evangelical Lutheran Church in America (ELCA) was formed nearly 25 years ago, we deliberately included the word “Evangelical” in our name. We did so to make it known that anyone who embraces that fundamental focus on Jesus Christ is welcome to be a member of one of our congregations: old, young, Democrat, Republican, Independent, African American, Caucasian, Hispanic, straight, gay, single, married — yes, anyone. We are different; yet held together in Jesus Christ. What identifies us is not our position on a political issue or our stance on a complex moral question where we have inevitable differences of opinion. No, being “evangelica” is simply to trust completely in Jesus Christ. Can we ever recapture the true meaning, the essence, of being “evangelical”? Probably not in the current election round. But those of us who hold to its true meaning must continue to remind our neighbors and friends and each other that being “evangelical” is something else, something different. Originally posted March 6, 2012, in the Green Valley News Letters to the Editor section. Republished with permission of the editor. 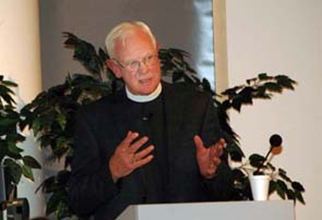 Herbert Chilstrom was presiding bishop of the ELCA from 1987 to 1995. He lives in Green Valley, Ariz.
Herbert W. Chilstrom was presiding bishop of the ELCA from 1987 to 1995. He lives in Green Valley, Ariz.